Welcome to the Bear River High Class Of 1963 web site. We hope you find this easy and informative and will use it often. 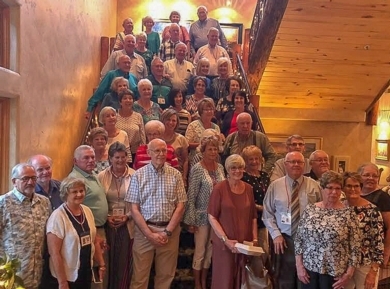 A generous thanks to all who attended the 55th Year Reunion at the Lodge at Maddox. Those attending renewed friendships, laughed a lot, and shared memories. There were 82 present. Fourty-eight (48) were classmates. There was a surprising number who attended our class reunion for the first time. There were also some who have not attended regularly, who enjoyed the evening. We all had an excellent meal, the very best company, and great entertainment. Blaine gave everyone a beautifuly finished cell phone holder that he made by hand - more than 100 of them. Blaine also made a handsome wooden donation box that will stay with reunion committees. Jerry used his great MC skills and kept us laughing, Carol Ann told stories about us. Some true and most not true at all (they were the best). Janet sang to us. Her talent still amazes. Dan provided guitar accompaniment for the School Song. We also enjoyed a presentation prepared by Jerry and Aralee highlighting those 21 classmates who have died over the years. We talked until they turned out the lights on us. Some of us are suffering from phyical and emontional difficulties and losses, but it did not show. It is so nice to be part of such a happy group of friends. We had not planned to have a class photo, but someone suggested that everyone gather on the steps for a classmate photograph. Unfortunately, since the picture was spontaneous, some had already left for home. Hope you enjoy. A 2023 (60th yr) reunion committee was chosen. Dennis Fuhriman is the chairman assisted by Virgil Pugsley. Janet Thompson Cook, and Aralee Schothern. This will be good! We also solicited donations to kick-start the next reunion and to keep the website supporting and connecting us. Classmates and their guests raised more than $800. We will now be able to pay for our website subscription and give the next committee the ability to prepare for the next reunion. Hope to cross paths with you soon, but if not, see you in five years. Good Health to You!